Aquagenic urticaria (AU), also known as water urticaria and aquagenous urticaria, is a rarely diagnosed form of physical urticaria. The name is derived from Latin: Aquagenic, meaning water-induced, and Urticaria, meaning hives. Contact with water, regardless of its temperature and source, induces the formation of hives and a rash with intense itching and pain. AU must be separate to Aquagenic pruritus and Aquadynia that are characterized by the total absence of skin lesion. This condition affects women more often than men. According to the literature, both sexes are involved equally in the infantile form of aquagenic urticaria. Generally starts during puberty; it occurs rarely in children, there are few such cases in the literature. Family cases are also uncommon, although familial incidents have also been reported. Most patients are isolated cases. One in every 230 million people in the world have aquagenic urticaria. Currently there are around 30 cases published with this condition in the whole world. Aquagenic urticaria usually causes the skin to itch and burn after being exposed to water of any kind. The skin usually develops hives, erythema , rash within 1 to 15 minutes . The pain and lesions usually persist for between 10–120 minutes. Urticaria appeared while taking a bath or a shower, in the rain, or after swimming (sea and swimming pool), in some patients also sweat and tears can be dangerouse. Lesions are located mainly on the upper body: neck, trunk, shoulder, arms, and back. Lesions' formation is not influenced by temperature or water source. Other organic solvents such as ethanol or acetone applied to the skin do not induce aquagenic urticaria. The test is the application of water to the skin (upper body) for 30 minutes and observing the reaction: a positive response occurs in minutes (10-15 minutes). Water may be placed directly on the skin or from a saturated wet paper towel. Usually a water-challenge test with tap water, distilled water, and normal saline showed similar results. physical urticaria like pressure urticaria, cold urticaria, heat urticaria, cholinergic urticaria; a diagnosis of AU requires exclusion of other types of similar deseases. First of all, water of any temperature can provoke AU; however, using water at room temperature avoids confusion with temperature-induced urticaria. In addition, a forearm or hand can be immersed in water of varying temperatures. Cold urticaria is tested by placing an ice cube on the forearm for four minutes and then watching the area over a 10-minute period. Cholinergic uticaria is tested with provocation by exercise or with an hot bath. Contact uticaria occurs after exposure to some offending substance such as stinging nettles or as an immune reaction to a substance such as nickel. A summary of the provocation test for other physical urticaria is shown in the table. (Familial aquagenic urticaria: report of two cases and literature review, 2009. 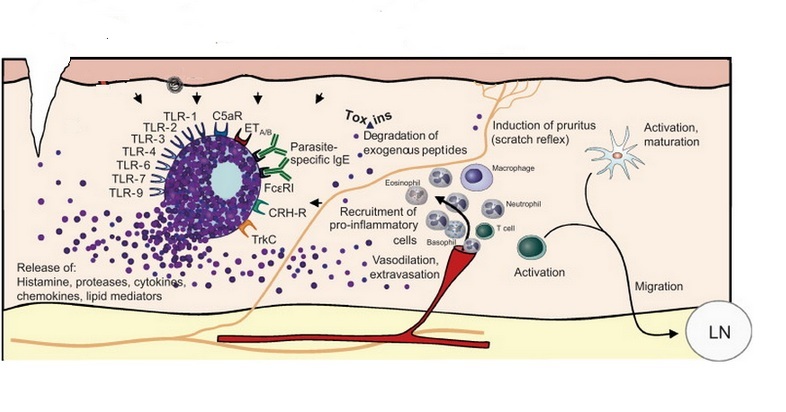 The pathogenesis of AU remains unknown; however, several mechanisms have been proposed. In 1964, Shelley and Rawnsley suggested that water interacted with components of the corneal strata or sebaceous glands to form a toxic substance (unknown) that would be absorbed by the skin; the result is degranulation of perifollicular mast cells and histamine. release, which would produce urticarial lesions. Sibbald et al. 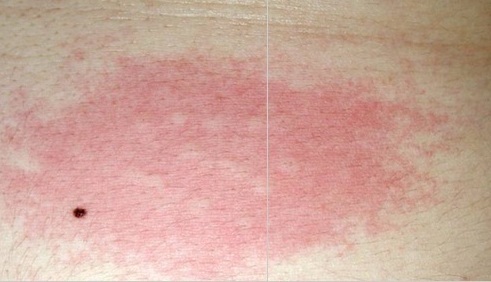 demonstrated that complete removal of the stratum corneum appeared to worsen the reaction, rather than prevent urticaria. These authors also demonstrated that pretreatment with organic solvents enhances wheal formation in contact with water. They suggested that enhancement of the ability of water to penetrate the stratum corneum increases wheal formation. Czarnetzki et al. suggested that the "toxic substance" hypothesized in 1964 was a water-soluble antigen in the epidermal layer that, in contact with water, would diffuse throughout the dermis, causing mast cells to release histamine. Tkach hypothesized that hypotonic water sources could lead to osmotic pressure changes, resulting in indirect provocation of urticaria. Others have recently stated that 5% saline was more effective than distilled water for eliciting the wheal-and-flare reaction. They hypothesized that the salt concentration and/or water osmolarity may influence the pathogenic process of AU, possibly by enhancing solubilization and penetration of a hypothetical epidermal antigen, in the same way as has been postulated for enhancement of organic solvents. Histamine appears to be the chemical mediator in the pathogenesis of aquagenic urticaria but there are some problems: blood's levels of histamine in AU cases are variable from patient to patient and sometimes there is not an increase of histamine during the production of urticarial lesions. - Acetylcholine because of the ability of the acetylcholine antagonist scopolamine to suppress wheal formation when applied to the skin before water contact. However, another study failed to reproduce this finding when pretreatment with atropine did not result in suppression of subsequent wheal formation. 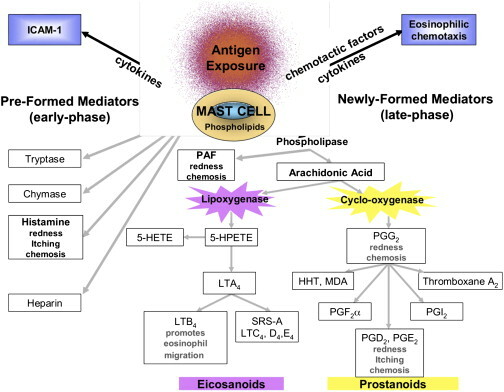 However, the mechanisms induced by these mediators are unclear and there isn't a satisfating responce to one specific therapy in the great number of patients. In conclusion, although the clinical picture of AU and diagnostic procedures are well established, pathogenesis remains unclear. 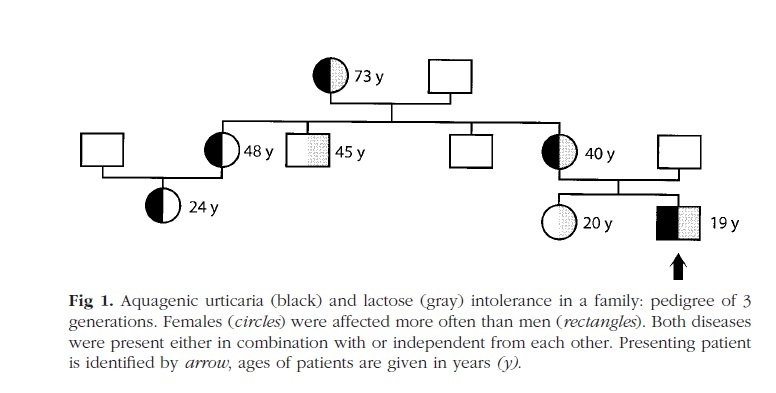 Although the association of aquagenic urticaria with lactose intolerance may be coincidental, attention is drawn to the fact that the 2 conditions, known to be familial, may coexist in the same family, possibly based on an association of gene loci. Chromosome 2q21 was identified to carry the responsible gene regulating the manufacturing of the enzyme lactase wich is deficiency in people with lactose intolerance. Female siblings with aquagenic urticaria who also suffered from Bernard-Soulier syndrome , also known as benign Mediterranean macrothrombocytopenia have been studied. This pathology is characterized by prolonged skin bleeding time, a reduced platelet count, and increased platelet volume. The disorder is produced by mutations of the platelet glycoprotein (GP) gene located in: locus 17pter-p12, locus 22q11.2, or in chromosome 3. This protein functions as a receptor for von Willebrand factor. The three individuals presented in the article have both aquagenic urticaria and Bernard-Soulier syndrome. Although this could be a coincidence, it might constitute an association of genetic loci. The association of aquagenic urticaria with other diseases, some of them being genetically determined, has been described, ie, atopy, polymorphous, light eruption, cholinergic urticaria, HIV infection or Bernard-Soulier syndrome, could be useful for studying the etiopathogenesis of Aquagenic urticaria. It should be pointed out that the genetic loci involved in these patologies are different. This could indicate that AU may be caused by mutations in different genes, located in different chromosomes. Further cases of association with aquagenic urticaria and other diseases are required to define the genetic bases of this disorder. Capsaicin is used to produce a cream called Zostrix that is applied to reduce pain. Capsaicin is also used for Herpes zoster. Oral antihistamine such as hydroxyzine, hydrochloride, cyproheptadine, terfenadine have been reported to be useful, but the therapeutic response is variable. Their antagonism of histamine is competitive and reversible. These compounds are readily absorbed in the gastrointestinal tract. Otherwise benefits of histamine antagonist are questionable because histamine is not the conclamate causative factor in water urticaria. Epinephrine is transiently helpful, especially in patients with severe bouts of acute urticaria. Not only does this drug help to decrease cutaneous vasodilation, but it also inhibits mast cell degranulation by raising cAMP levels. Topical corticosteroids are not efficacious in urticaria, but parenteral corticosteroids have been used. The rationale for their use is not clear, but they are often effective. PUVA therapy was succesfully used in one 21-year-old, woman four times a week, daily increased. 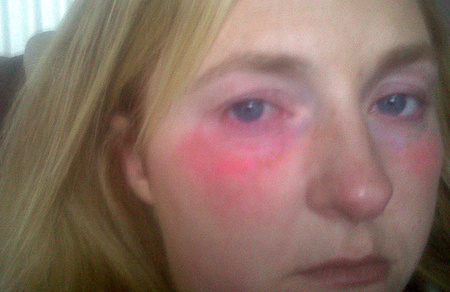 After 20 sessions, the patient could receive PUVA a therapy only once a week, and lesions recurred 2 weeks later. 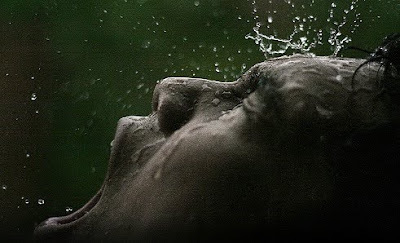 Also dermatologists recommend avoiding contact with water as much as possible by taking short showers, staying cool,avoiding rain (taking an umbrella), going for a swim is out of the question. In conclusion there is not a cure for aquagenic urticaria: all these treatment allow patients only to live a more comfortable life.